It's been a while since I've seen anything on this so I thought I'd toss this in. The first two are pretty much self explanatory and found in many other 3D programs. Some you may have seen from me before. Your thoughts are always welcome & thanks for reading. If a layer is hidden, then we should have the option for the objects on that layer to also be hidden in the object palette. The object palette could be greatly reduced in a flash, having only the objects of "visible" layers. A ghosted layer would have its objects names greyed out. Could the slider start with 0 in the center, so we can move in the negative direction. 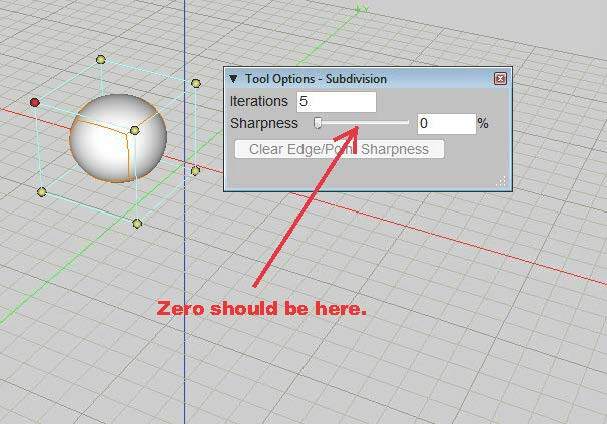 This would help smooth corner points where edges meet. Would it be possible to add this option to the Save as menu item? Right click contextual menu? The files would save with the same name as the layer in the same folder with the master file. Layers in groups would be individual layers in the new file. (which, like any other, can be hidden, visible or ghosted). This should be on the uppermost level of the program with its current selection always visible (perhaps as part of the “Input Palette”) The menu could have a "delete", and "ghost on current layer". When a new project is opened from a template file, I think the name should be something other than untitled. Perhaps call it "template: file name". Something to indicate what is being loaded without digging into the preferences. Perhaps a file menu item "Open Template File..." An option in the save dialog to "Save as Template File" would be a nice addition. Change the length of the axis. in the corner of the modeling window would be a great help. This was dropped moving to V7, could it return please. Simple checkbox to match the snap interval with the grid. 4. Could you give an explanation? 5. Absolutely! Could be done with a script, fairly easy, assuming that functionality ever comes back. 6. Yea, would clean up some time consumption artifacts. would have to deliberately attempt to use, it as I have so habituated myself around not having something like this. 7. Been wanting to do this as a script myself. I think I have asked for it in the past as well. If not, Brilliant! 8. Don't run into a problem here, but then again most of my work is relatively small. no larger than a small building. Should be obvious nowadays, all points. 11. Bring back DRAFT 2d workspace! Seems to me that the starting point should be in the center to allow a negative influence into the object. Not able to reproduce the edges I wanted to show right now. Can we please replace the "auto pick" option (something I never use, but always seem to be active) with the "group" level that we had prior the V7? Life was splendid when this was the norm. Been a thorn in my side since. The UV unwrapping is a big deal. I've started to use Unity and I need to have a proper UV.